علیزاده, بهرام. (1395). نقدی بر اختیارگرایی دکارتی. ذهن, 17(68), 177-206. بهرام علیزاده. "نقدی بر اختیارگرایی دکارتی". ذهن, 17, 68, 1395, 177-206. علیزاده, بهرام. (1395). 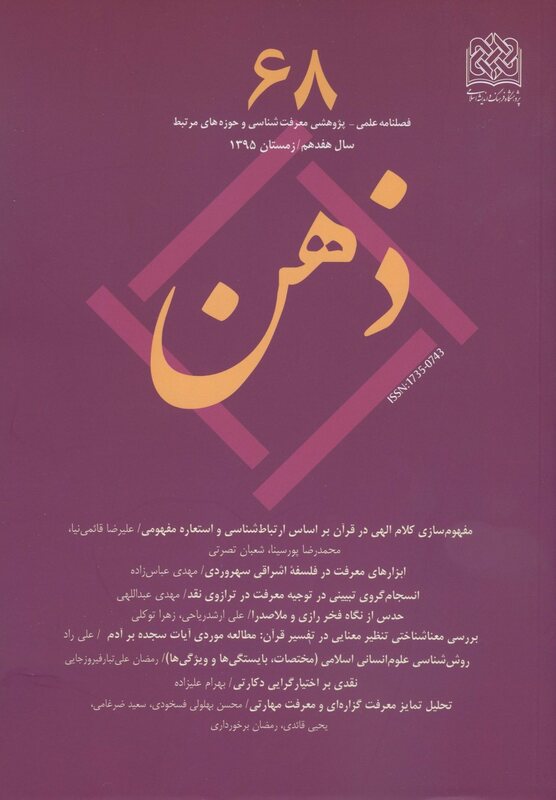 'نقدی بر اختیارگرایی دکارتی', ذهن, 17(68), pp. 177-206. علیزاده, بهرام. نقدی بر اختیارگرایی دکارتی. ذهن, 1395; 17(68): 177-206. همسازگرایی دیدگاهی است که می­گوید دترمینسم منطقاً با اراده آزاد همساز است و اختیارگرایی به عنوان شاخه­ای از ناهمسازگرایی معتقد است در یک جهان دترمینیستی اراده آزاد امکان تحقق ندارد، ولی اراده آزاد محقق است؛ پس دترمینیسم نادرست است. آیا دکارت یک اختیارگراست؟ از این جهت که دوگانه­انگاری این امکان را به «خود» می­دهد تا علتی ورای علت­های دیگر باشد، احتمالا او یک اختیارگراست. با وجود این خواهیم گفت، که اختیارگرایی او به جای تاکید بر مولّفۀ ناهمسازگرایانۀ «امکان­های بدیل» بر مولفه همسازگرایانه «خودانگیختگی» مبتنی است. در نهایت می­توان گفت که دیدگاه او از سه جنبة مهم همسازگرایانه محسوب می­شود. رنه دکارت؛ تأملات در فلسفه اولی؛ ترجمه احمد احمدی؛ تهران: انتشارات سمت، 1381. ـــــ؛ قواعد هدایت ذهن، اصول فلسفه و انفعالات نفس؛ ترجمه منوچهر صانعی دره‏بیدی؛ تهران: انتشارات بین المللی الهدی، 1376. ـــــ؛ اعتراضات و پاسخ­ها؛ ترجمه علی افضلی؛ تهران: انتشارات علمی فرهنگی، 1386. جان کاتینگهام؛ فرهنگ فلسفه دکارت؛ ترجمه علی افضلی؛ تهران: مؤسسه پژوهشی حکمت و فلسفه ایران، 1391. The Philosophical Writings of Descartes; translated by John Cottingham, Robert Stoothoff and Dugald Murdoch; and Anthony Kenny for vol.3, 3 vols, Cambridge: Cambridge University Press, 1991. Cottingham, John (ed. ); Reason, Will, and Sensation: Studies in Descartes’ Metaphysics; Oxford: Clarendon Press,1994. _____ (ed); Cambridge Companion to Descartes; Cambridge: Cambridge University Press, 1992. Clarke. Desmond. M, (ed.) ; Descartes’s Theory of Mind; New York: Oxford University Press Inc., 2003. _____; “Causal Power and Occasionalism from Descartes to Malebranche” in Gaukroger et al; 2000, pp.131-148. Carruthers, Peter; “The Illusion of Conscious Will”; Synthese, Vol.159, No.2, Self-Ascriptions of Mental States, Nov. 2007, pp.197-213. Hoffman, Paul; The Passions and Freedom of Will: Essays on Descartes; Oxford University Press, 2009, pp.210-236. Chappell, Vere; “Descartes's Compatibilism; Reason, Will and Sensation”; Studies in Cartesian Metaphysics, ed. by John Cottingham; Oxford: Oxford University Press, 1994, pp.177-90. Schouls. Peter; “Human nature, Reason, and Will in the Argument of Descartes’s Meditations”; Studies in Cartesian Metaphysics, ed. by John Cottingham; Oxford: Oxford University Press, 1994, pp.159-77. Blackburn. Simon; Think; Oxford: Oxford University Press, 1999. Harry Frankfurt; “Alternate Possibilities and Moral Responsibilities,” in Gary Watson, ed. ; 2nd ed., Free Will Oxford: Oxford University Press, 2003. Des Chene, Dennis ;Spirits and Clocks: Machine and Organism in Descartes; Ithaca, NY: Cornell University Press, 200. O’Connor. Timothy; “Free will”; Stanford Encyclopedia of Philosophy; 2002 (rev. 2005). Ayer. A. J.; “Freedom and Necessity” In his Philosophical Essays; New York: St. Martin's Press,1954. Beyssade, Michelle; “Descartes’s Doctrine of Freedom: Differences between the French and Latin Texts of the Fourth Meditation” in Cottingham; 1994, pp.191-206. Dennett, Daniel; Elbow Room: The Varieties of Free Will Worth Having; Cambridge. MA: MIT Press, 1984. Baker, Gordon, and Morris, Katherine J.; Descartes’ Dualism; London: Routledge, 1996. Von Wright, G. H.; Causality and determinism; New York: ColumbiaUniversity Press, 1974. Fischer, J. M. & Kane, R. & Pereboom, D. & Vargas, M.; Four Views On Free Will; ed, Ernest Sosa; Blackwell Publishing, 2007. Fischer. J.M; “Frankfurt-type Examples and Semi-Compatibilism” published in The Oxford Handbook of Free Will;ed by Robert Kane; Oxford University press, 2001. Ishtiyaque, Haji; “Compatibilist Views of Freedom and Responsibility” published in The Oxford Handbook of Free Will; ed by Robert Kane; Oxford University press, 2001. Hobbes, Thomas; Leviathan; Indianapolis: Bobbs-Merrill, 1958. Kane, Robert; “A Contemporary Introduction To Free Will”; Oxford University Press, 2005. Harry Frankfurt; “Alternate Possibilities and Moral Responsibilities” in Gary Watson (ed. ); 2nd ed., Free Will; Oxford: Oxford University Press, 2003. Rosenthal, David M.; “Will and the Theory of Judgment” in Chappell; 1997, pp.129-158. Van Inwagen, Peter: An Essay on Free Will; Oxford: Clarendon Press, 1983.